Designed in Hackney: we conclude our week of fashion design from Hackney with Hussein Chayalan and his dresses that emit laser beams. The laser dresses for Swarovski were the finale to Chayalan's Spring Summer 2008 collection, called Readings, and were inspired by ancient sun worship and contemporary celebrity status. 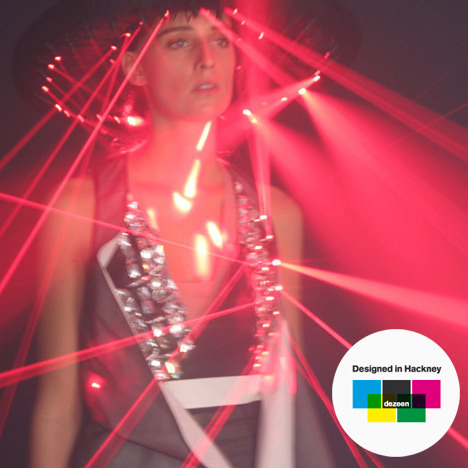 Hundreds of moving lasers were embedded in the clothing, together with crystals that refracted the rays of red light. These images are from a movie by Nick Knight. Watch the movie here. Chalayan's studio is in the south of Hackney - see all our stories about his work here and see the studio's latest collection at www.chalayan.com.